Several handy tools and products can be seen in the market which brings up a lot of utility for the users. A number of products have evolved over the years and their modern shape is incomparable with what we saw in the pioneer products of the category. 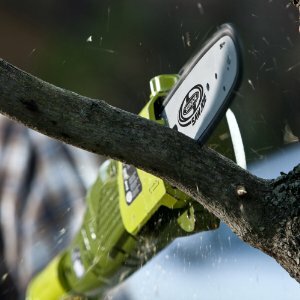 One such great example of such a tool type is the electric pole chainsaw which is a very useful item that we can ever have for managing a lot of our tasks. If we talk specifically then the electric pole chainsaw from the SunJoe manufacturer has surely impressed the masses, particularly across the North America region. It has got various uses both in constructive and art related projects. However, this specific one is ideally designed for manicuring your garden to bring it in the best of its shape. Beware of its sharp blade as mishandling the tool can really result in some very lethal results. You will know about all the major and minor aspects of the tool in the section to come. The first and foremost factor that is obvious about this tool from SunJoe maker is its economical price which makes it affordable for anyone looking to properly manicure their garden. It comes with a very useful ergonomic handle so that you can use it for long hours of work. The rubber cover handle with this chainsaw is specially introduced for providing the topmost comfort for the users. The oil lubrication for many of the users is a big issue with such products, but for this one auto oil lubrication is done. It is a chainsaw with 8 inches of the blade so you can trust it to look after the trimming of some large trees as well, and not only the plants. Once, you are done with the job, then you can make use of its plastic blade cover which will provide you with the safest of storage. This is an electric chainsaw, which is equipped with a whopping 6.5 AMP of motor. This is an excellent capacity motor which can handle some of the toughest jobs with utmost ease. There is no limit for you to work for a limited time due to fuel limitations and with a continuous power, you can work as long as you need. The chainsaw has an ergonomic grip so there wouldn’t be any issue when using the tool for a long time or for some tougher jobs.there will not be any issue regarding the handling of the chainsaw and the user would not get tired soon. The tension mechanism is another great thing about the product which allows you to perform your task effortlessly. The mechanism helps the tool to work quickly and with a greater power. You can extend the tool to as long as 8 feet to accomplish the objectives of your tasks without needing a ladder. It can reach into places that is usually hard to reach or see through easily. The price of the tool is fairly economical and it will not be a burden to your pocket. The tool can be a bit heavy for short and lean users. So, they can have serious issues while using the tool. But it is not too heavy and can be easily carried and used by the majority of the chainsaw users. The saw cannot be detached from its pole so you cannot use it as a standalone chainsaw. Several users have serious issues with the customer service as they are not more knowledgeable about the product. Further, many of the users also reported that the customer service agents aren’t too helpful either. This is a fine electric chainsaw tool from SunJoe maker. The best features of this product are its 6.5 AMP motor, extendable unit, ergonomic grip, plastic blade cover and auto oil lubrication. There are some issues as well with the product where the most troublesome one is that the tool is too heavy. People with shorter height and lean body would have some serious kind of issues in using this tool.